The two presidents met in Kyiv. Ukrainian President Petro Poroshenko and his Turkish counterpart Recep Tayyip Erdogan have signed a joint statement following the sixth session of the Ukraine-Turkey high-level strategic council. Erdogan came to Kyiv on 9 October. "Today's agreements will certainly help us to increase and enhance the scope of cooperation," Poroshenko said at a news conference. He noted that the bilateral agreement on investment protection and the changes made to the agreement on avoidance of double taxation would give additional impetus to bilateral cooperation. Ukraine and Turkey also signed the action plan for the development of bilateral relations for 2017-19. The sides also signed a memorandum of cooperation between the diplomatic academies of Ukraine and Turkey; amendments to the agreement on mutual assistance and protection investments between the two governments; a protocol on amendments to the agreement on avoidance of double taxation and on the prevention of tax evasion with respect to taxes on income and property; an implementation protocol on cooperation with regard to geographic information. 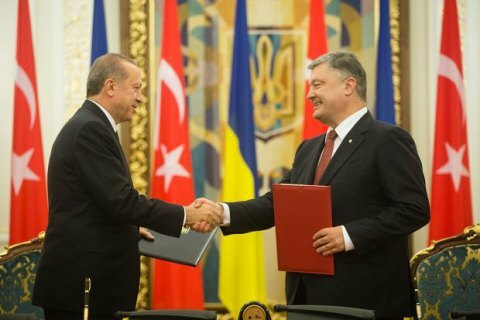 Also, contracts were signed between the Ukrainian and Turkish defence companies.